Updated Does Maw trigger if the Runner uses Salsette Slums to remove an accessed card from the game? Yes. The Runner accessed a card but did not steal or trash it. If the first card the Runner accesses not in Archives that they do not steal or trash is an agenda that they host on Film Critic, does Maw trigger? Yes. The Runner accessed a card and did not steal or trash it. Maw's trigger condition can only ever be met after an access ends, so it isn't a condition met by entering the "accessing a card" timing structure. Ending the access prematurely with Film Critic won't invalidate its trigger condition. 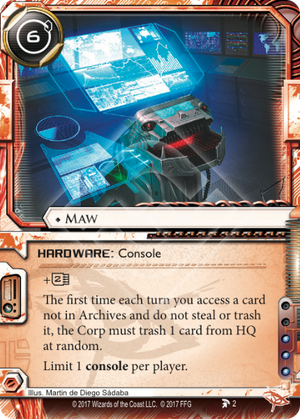 If the Runner does not steal or trash the first card they access in HQ, and that card is then randomly selected for Maw's trigger, is the card trashed to Archives faceup or facedown? The Corp trashes that card to Archives faceup as it is currently visible to the Runner. Does Maw trigger when the Runner accesses but does not trash an upgrade installed in the root of Archives? Yes. Cards in the root of Archives are not considered in Archives. How does Maw work if the Runner accesses more than one card from HQ during a single access step (e.g. through Legwork)? The first of the accesses from HQ that the Runner does not steal or trash triggers Maw. Before continuing accessing cards, the Corp trashes a card from HQ at the same time, which can include a card already accessed during this access step. As a best practice, resolve HQ accesses by placing all the cards in HQ facedown on the table. Thus, the Runner can flip cards faceup to access them, as well as roll a die or use some other method to select a random card to perform another type of effect (such as trashing with Maw). Look at that! 3 influence for a powerful console. What a novel idea!!! And because my review must be longer: Combine with Salsette Slums when accessing assets and upgrades (or trash-able ICE and Operations) to still get the effect.